In late Spring, the big news in the fitness community was the science backed “7 Minute Workout” – a set of 12 exercises meant to be done for 30 seconds each with 10 seconds of rest in between. The research showed that doing these 12 body-weight exercises would give you an effective and efficient full body workout. I began using this workout right away. We had just moved, and I hadn't signed up for a gym membership. I was looking for something that would get my heart rate up but still strengthen my muscles. 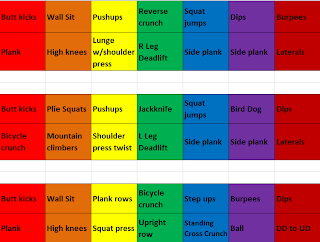 I followed this program pretty closely at first, although I would do two and then three sets at a time to get a proper workout. Now that I am focusing more on running I have been doing less strength workouts, but I still like the format of this one. I've slowly been adapting it to better reflect my needs (quads! and still working on tightening the leftover arm skin from losing lots of weight). 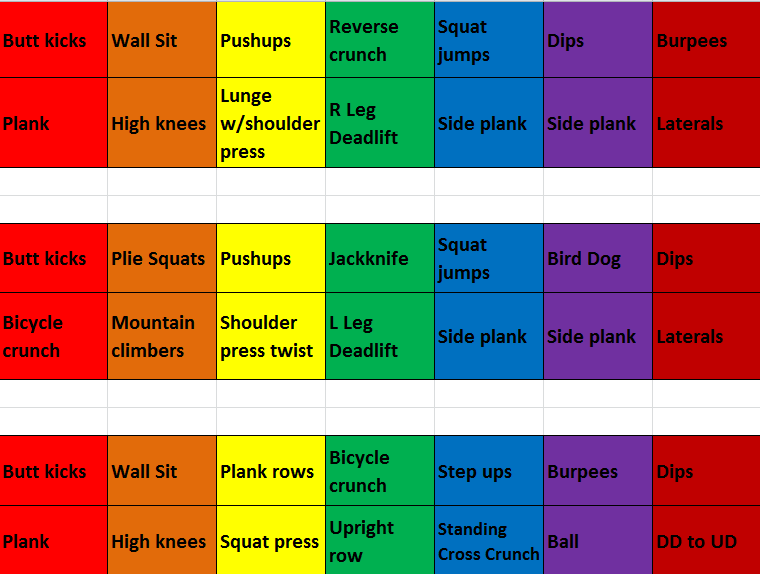 I adapted it again yesterday, and did the workout this morning after a mile run for warm up. I use the app IntervalTimer to time my intervals. Each exercise is performed for the full 30 seconds, either as many reps as possible or static hold for the 30 seconds (plank ,etc.). The rest should make sense, if not send me an email or a comment. Enjoy!